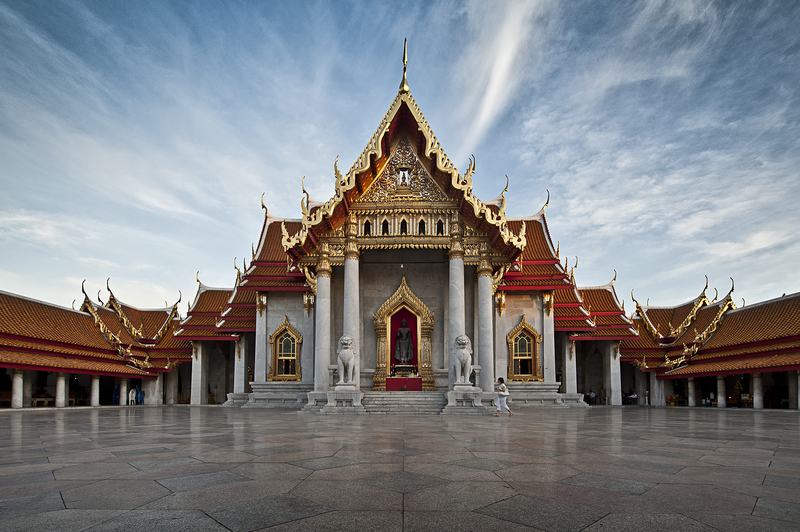 Your trip to Bangkok is not completed unless you have seen the subtle and intricate beauty of our temples. In appreciation of your patronage, we are pleased to give you a Free Half Day City Tour for those who book for 2 units (as a group of families or friends) and stay longer than a week in one of our luxurious apartments or premium condominiums. 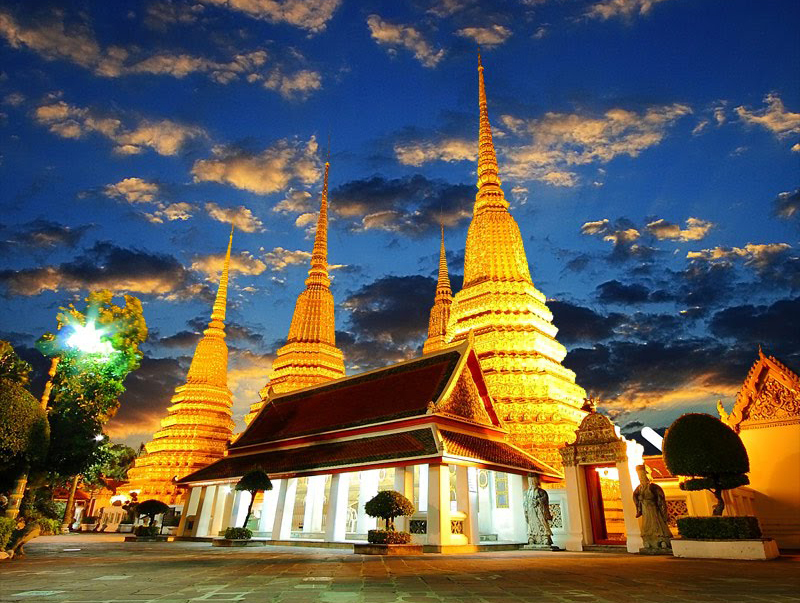 Wat Pho (The Temple of the Reclining Buddha) is Bangkok’s oldest and largest monastic complex. This is possibly the most interesting temple in Thailand as it combines history, medical science and is a center for meditaion and traditional massage training. Its official name is Wat Phrachetuphon Vimon Mangkararam Ratchaworamahawihan, although it is commonly called Wat Po. Founded during the 16th century, Wat Pho is most famous for the golden reclining Buddha that measues 46 metres and has feet inlaid with mother‐of pearl. This is the main attraction that draws visitors to the temple. In more modern times, Wat Pho has gained international recognition as a meditation centre and for the traditional Thai massage that is both practiced and taught here. Traditionally, temples were the schools as there was no formal education system, with monks providing basic lesson in both spiritual and secular subjects. 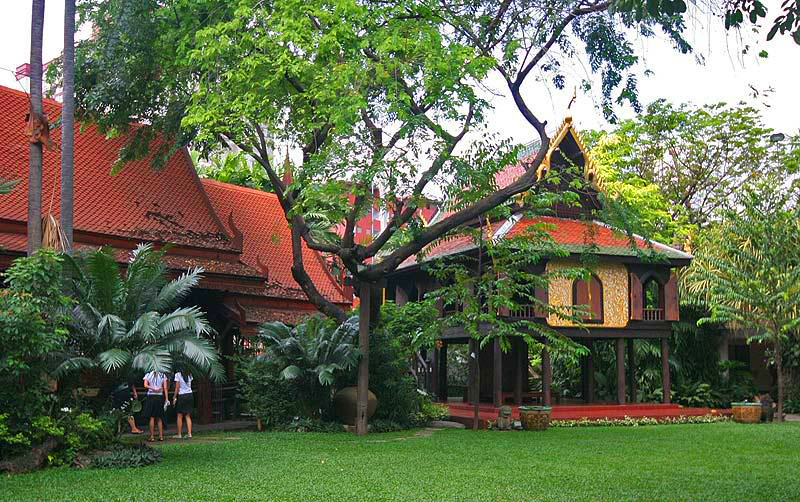 King Rama III turned Wat Po into a major centre for learning in botany, geography and history. For those interested in traditional Thai medicine, there is a pavilion that serves to both impart knowledge and provide treatment. The walls have marble tablets describing basic anatomy and treatments. In the late afternoon, traditional medicine practitioners are there to dispense herbal mixtures. Nearby, there is a cloister where you can have a traditional Thai massage for a very small payment. Open daily: 8.30 a.m. ‐ 6.00 p.m. The Grand Palace Every visitor to Bangkok should see the magnificent buildings within the Grand Palace compound to get a feeling of the grandeur architectural style. The main buildings within the Grand Palace compound were built for King Rama V, who was the first Thai King to travel to Europe. 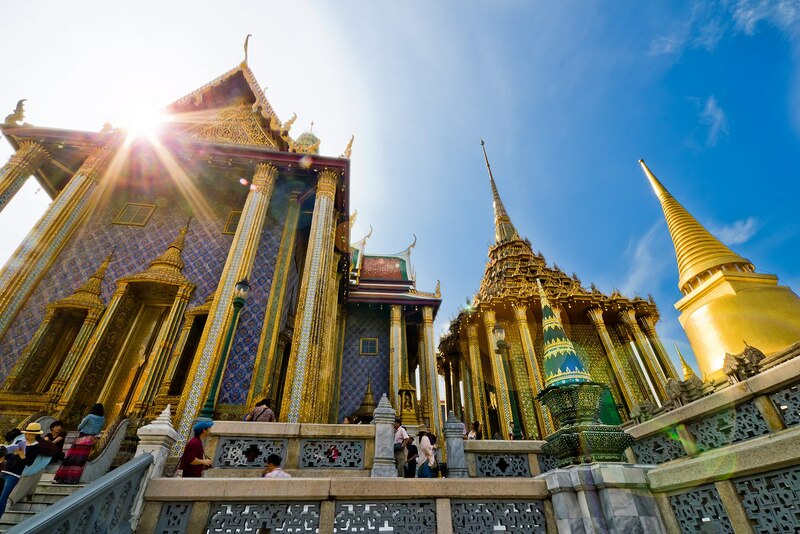 Phra Thinang Chakri Maha Prasat, built in 1877 by King Rama V as his Royal Residence, is the most highly recognized architectural landmark of the Nation. The central Throne Hall, which was formerly used for the reception of foreign envoys, is flanked by reception areas decorated with galleries of portraiture. The central room on the second floor is used as a shrine for the reliquary ashes of Kings Rama IV, Rama V, Rama VI, Rama VII and Rama VIII. Borom Phiman Mansion was also constructed during the reign of King Rama V. When his son, King Rama VI ascended to the throne, he had it improved for use as his residence. The three succeeding Kings also resided here at one time or another. The Siwalai Gardens, where the office of The Royal Household Bureau is located, were used for receptions as well as a recreation area for the royal women and children. Maha Monthien Prasat houses The Audience Hall of Amarin Winitchai where ceremonies of the Court usually take place in front of the throne surmounted by its canopy of nine tiers of white cloth. Admission Fee: Baht 350. This also includes admission to Wat Phra Kaeo, The Royal Thai Decorations & Coins Pavilion in the same compound and to Vimanmek Mansion Museum on Ratchawithi Road. Baht 100 for rental personal audio guide in English, French, German, Spanish, Russian, Japanese or Mandarin. Wat Arun Make sure you set aside one late afternoon to see and photograph this imposing sight at sunset with the Chao Phraya River in the foreground. These photographs will bring back beautiful memories of Bangkok. The temple was built during the Ayutthaya period and was originally called Wat Makok after the name of the local village Tambol Bangmakok. It means “Village of Olives”. Wat Arun gets its name from Aruna, the Indian god of the dawn, hence its common name The Temple of Dawn. The location of the temple is in the area that used to be occupied by the palace of King Taksin who reestablished the Siamese Kingdom after the fall of Ayuttaya more than two hundred years ago. The main Buddha image is believed to have been designed by King Rama II. 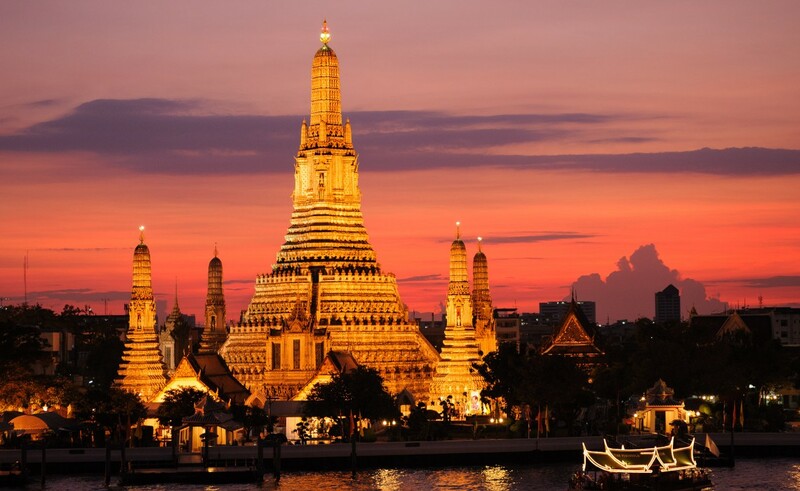 Wat Arun, often called The Temple of Dawn, is one of the most remarkable visual identities of Bangkok. The imposing Khmer‐style prang or tower is 67 metres tall and decorated with bits of porcelain that was used as ballast by boats coming from China. It is surrounded by four smaller prangs. Construction of the prangs were started by King Rama II and completed by King Rama II. The central balcony is an ideal spot for looking across the river to The Grand Palace and The Temple of The Emerald Buddha. Each year at the end of the three‐month lent period for Buddhist monks, H. M. The King or his appointed representative travels down river in a Royal Barge Procession to present new robes to the monks. This ceremony is called Royal Tod Kathin. Open daily: 7.30 am. to 5.30 pm. Suan Pakkad Palace A visit to this exquisite collection of traditional Thai homes, set in beautiful gardens, gives you an insight into the appreciation of art and gardening by members of the Royal Family. The reception area of House 2 exhibits personal items such as ivory boxes and bowls inlaid with mother of pearl. Lovers of Thai musical instruments will be impressed by the collection in House 3 which also has a palanquin, nielloware and ceramics. The theatrical aspect of Thailand is on display at the Khon Museum is House 7. This exhibit includes Khon masks, costumes, accessories and a model of a troupe performing the Ramakien. Other displays and exhibitions are in the Lacquer Pavilion and the Marasi Gallery which also has an information system on Ban Chiang art and culture. BTS Skytrain: Phaya Thai BTS station. Open: Daily from 9 am. ‐ 4 pm. Wat Benchamabophit To stand at the main gateway and look upon the Monastery of Five Kings is a sight to behold. The perfect symmetry and proportions must inspire admiration of this architectural masterpiece. Wat Benchamabophit Dusitvanaram is known to foreigners as The Marble Temple as its exterior is clad in Carrara marble. Very talented The Prince Naris, a son of King Rama IV , designed the main building which was completed during the reign of King Rama V.
The interior crossbeams are decorated with lacquer and gold. The walls of the spacious inner courtyard are lined with a large collection of bronze Buddha images. The canal in front and to the left hand side has ornate bridges. It is advisable to come in the early morning to see local people offering alms to the monks as they do not go outside as monks at other temple do. Stand at the main entrance to the compound and watch the pigeons take flight. If you cant be there at this time, go at sunset when the main doors are illuminated. This is another sight well worth witnessing. Open: Daily from 6 a.m. ‐ 6 p.m.